The ultrasonic processor UP50H is typically used for the sonication of small lab samples. This homogenizer allows for the handheld or stand-mounted emulsification, dispersing, dissolving or cell disruption. 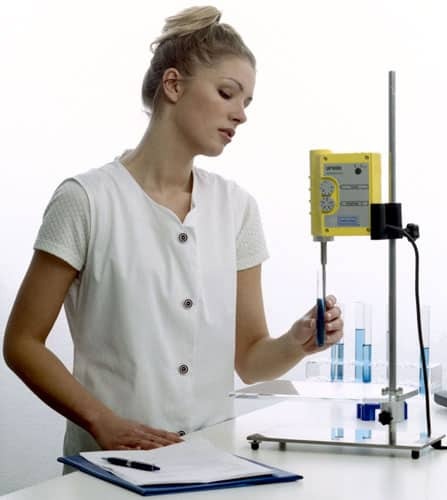 The ultrasonic processor UP50H (50 watts, 30kHz) is the smallest model of our aesthetic laboratory devices, that are only supplied by Hielscher Ultrasonics in that compact form. The UP50H is used in particular in medical, biological or chemical laboratories, where small volumes need to be sonicated. Application fields are found mainly in the analytical field with applications such as the disruption of tissues, the cracking of bacteria or the homogenizing of samples in the food industry. This device is perfectly suited for handheld operation with its lightweight 1.1kg, but it can also be operated at a stand. Generator and the transducer are combined in one unit, so there is only one cable. One power supply cord - that's all. For volume samples from 10µL up to 250mL we offer various replaceable sonotrodes with diameters from 0.5 to 7mm. Further accessories such as flow cells made of stainless steel or glass, timers or our PC-control are part of our standard program. Click at the links below, to read more about the applications of our ultrasonic devices. The UP50H can be used in combination with a flow cell D7K for the sonication of material in continuous flow, e.g. at 10 to 50mL/min. By this, you can simulate continuous sonication processes in smallest scale. For samples larger than 250mL we recommend using the UP100H (100 watts), UP200Ht (200 watts) or the UP400S (400 watts). The ultrasonic processor UP100H (100W, 30kHz) is the perfect device for the sonication of small and medium size lab samples. This compact, yet powerful, lab homogenizer is commonly used for sample preparation, such as emulsifying, dispersing, dissolving and cell disruption. In combination with the flow cell D7K you can sonicate material in continuous flow, e.g. at 10 to 100mL/min. By this, you can simulate continuous sonication processes in smallest scale. As the UP100H can be operated 24 hours per day (24h/7d), this setup could process up to 140L per day (depending on the application). The optional PC-control may be helpful, if a test record is necessary or to optimize processes. The UP100H is often used for general feasibility studies. For this, a small sample volume, e.g. 5mL is put into a small vial and is being exposed to intense sonication for a long time. The picture to the right (click to enlarge) shows a typical setup for the intensive sonication of small samples. Since ultrasonic power is put into the sample, the liquid would heat up quickly, unless cooled by a water bath. As the heat can dissipate to the cooling bath, the sample can be sonicated for a longer time, e.g. 20 minutes. 400 Watts ultrasonic power - The UP400S (400W, 24kHz) is a powerful and reliable ultrasonic device for the sonication of larger samples in the lab. Typical application include: Homogenization, deagglomeration, lysis and cell disintegration, protein extraction and the emulsification of liquids. The ultrasonic processor UP400S (400 watts, 24kHz) is our most powerful laboratory device. With sonotrodes of a diameter range from 3 to 40mm the device is suited for the sonication of sample volumes from 5 to 4000ml. In flow approx. 10 to 50 liters per hour can be sonicated. For the preparation of samples the UP400S is mainly used for bigger volumes. It is suited for the development of ultrasonic applications in the laboratory but also in the bench top optimization as well as for the production of small quantities. For production quantities a PC-control or a remote interface to a central control of the user’s facility is recommended in order to raise the process safety and reproducibility. The PC-control improves the reproducibilty when following specific sonication protocols. With special flow cells and flange connections liquids can also be sonicated at elevated temperatures and pressures. High power generates the intensive cavitation required, but this results in unwanted noise. For operating the UP400S we recommend to use the sound protection box. 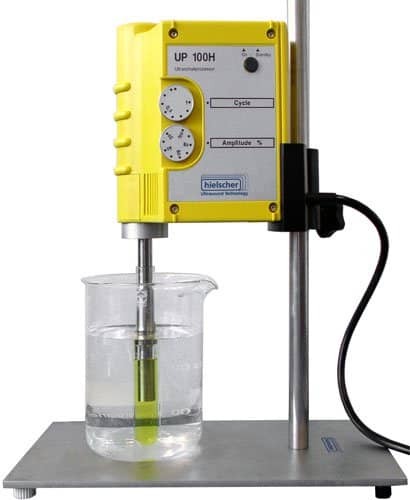 The ultrasonic processor UIP500hd (20kHz, 500W) is an industrial grade device for the application in the small scale processing of liquids. It can be used for the process development in bench-top scale before scale-up, too. The ultrasonic processor UIP1500hd (20kHz, 1500W) combines high processing power with flexibility. Is is suitable for process development, optimization and for production processes. This includes emulsifying, dispersing & sonochemistry, lysis & extraction or homogenizing. The UIP1500hd bridges the gap between laboratory testing and the industrial processing of liquids. Its wide range adaptability and easy operation meet the requirements of research and development. The UIP1500hd is built for heavy-duty operation in 24hrs/7days production processes under demanding conditions. The UIP4000 (4,000 watts, 20kHz) is used mainly for the industrial processing of liquids such as homogenizing, dispersing, disintegrating or deagglomerating. The powerful ultrasonic processor UIP4000 is used when high power is needed for continuous operation. It is controlled by a microprocessor and equipped with an LCD status display as well as with an interface for external control signals. This high-power system is particularly favorable, since no additional cooling media, such as water or compressed air, are necessary. The special design of this system allows for its use under extreme operation conditions, such as dust, dirt, temperature and humidity. The ultrasonic processor consists of titanium and stainless steel 1.4301 (other stainless steel types are available on request). The oscillation-free flange has proven very useful for the integration into machines and plants. It has been adapted to the new technical conditions in terms of correct oscillation-behavior. The modular concept of the UIP4000 provides you with a powerful and yet very space-saving system. The transducer and generator are housed separately from each other and are connected via cables. The self-contained design reduces the work required for installation, operation and maintenance to a minimum level. Multiple UIP4000 modules can be easily combined to form more powerful clusters. Nanomaterials have become an integral component of products as diverse as sunscreens, performance coatings, or plastic composites. 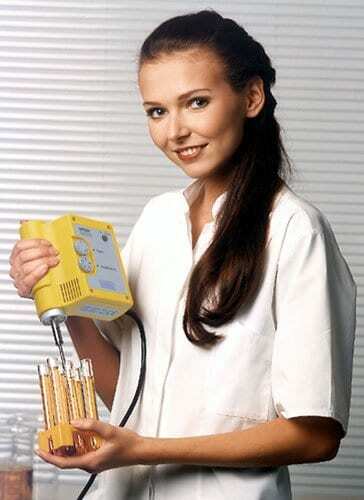 Ultrasonic cavitation is used to disperse nano-size particles into liquids, such as water, oil, solvents or resins. The application of ultrasonics to nanomaterials has manifold effects. The most obvious is the dispersing of materials in liquids in order to break particle agglomerates. Another process is the application of ultrasound during particle synthesis or precipitation. Generally, this leads to smaller particles and increased size uniformity. Ultrasonic cavitation improves the material transfer at particle surfaces, too. This effect can be used to improve surface functionalization of materials having a high specific surface area. Nanomaterials, e.g. metal oxides, nanoclays or carbon nanotubes tend to be agglomerated when mixed into a liquid. Effective means of deagglomerating and dispersing are needed to overcome the bonding forces after wettening the powder. The ultrasonic breakup of the agglomerate structures in aqueous and non-aqueous suspensions allows utilizing the full potential of nanosize materials. Investigations at various dispersions of nanoparticulate agglomerates with a variable solid content have demonstrated the considerable advantage of ultrasound when compared with other technologies, such as rotor stator mixers (e.g. ultra turrax), piston homogenizers, or wet milling methods, e.g. bead mills or colloid mills. Hielscher ultrasonic systems can be run at fairly high solids concentrations. For example for silica the breakage rate was found to be independent of the solid concentration up to 50% by weight. Ultrasound can be applied for the dispersing of high concentration master-batches – processing low and high viscosity liquids. This makes ultrasound good processing solution for paints and coatings, based on different media, such as water, resin or oil. Click here to read more about the ultrasonic dispersing of carbon nanotubes. Dispersion and deagglomeration by ultrasonication are a result of ultrasonic cavitation. When exposing liquids to ultrasound the sound waves that propagate into the liquid result in alternating high-pressure and low-pressure cycles. This applies mechanical stress on the attracting forces between the individual particles. Ultrasonic cavitation in liquids causes high speed liquid jets of up to 1000km/hr (approx. 600mph). Such jets press liquid at high pressure between the particles and separate them from each other. Smaller particles are accelerated with the liquid jets and collide at high speeds. This makes ultrasound an effective means for the dispersing but also for the milling of micron-size and sub micron-size particles. Nanoparticles can be generated bottom-up by synthesis or precipitation. Sonochemistry is one of the earliest techniques used to prepare nanosize compounds. Suslick in his original work, sonicated Fe(CO)5 either as a neat liquid or in a deaclin solution and obtained 10-20nm size amorphous iron nanoparticles. Generally, a supersaturated mixture starts forming solid particles out of a highly concentrated material. Ultrasonication improves the mixing of the pre-cursors and increases the mass-transfer at the particle surface. This leads to smaller particle size and higher uniformity. Click here to read more about ultrasonically assisted precipitation of nanomaterials. Many nanomaterials, like metal oxides, inkjet ink and toner pigments, or fillers for performance coatings, require surface functionalization. In order to functionalize the complete surface of each individual particle, a good dispersion method is required. When dispersed, particles are typically surrounded by a boundary layer of molecules attracted to the particle surface. In order for new functional groups to get to the particle surface, this boundary layer needs to be broken up or removed. The liquid jets resulting from ultrasonic cavitation can reach speeds of up to 1000km/hr. This stress helps to overcome the attracting forces and carries the functional molecules to the particle surface. In sonochemistry, this effect is used to improve the performance of dispersed catalysts. Ultrasonication of samples improves the accuracy of your particle size or morphology measurement. The new SonoStep combines ultrasound, stirring and pumping of samples in a compact design. 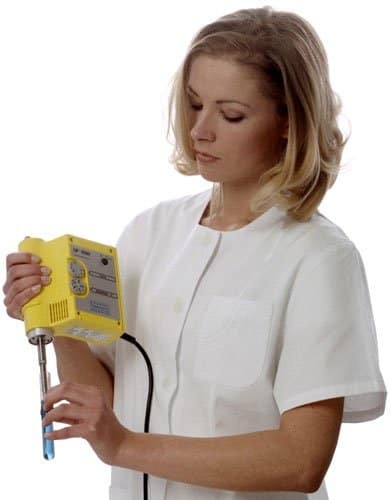 It is easy to operate and can be used to deliver sonicated samples to analytic devices, such as particle size analyzers. The intense sonication helps to disperse agglomerated particles leading to more consistent results. Click here to read more! Ultrasonic processors and flow cells for deagglomeration and dispersion are available for laboratory and production level. The industrial systems can easily be retrofitted to work inline. For the research and process development we recommend using the UIP1000hd (1,000 watts). Hielscher offers a broad range of ultrasonic devices and accessories for the efficient dispersing of nanomaterials, e.g. in paints, inks and coatings. 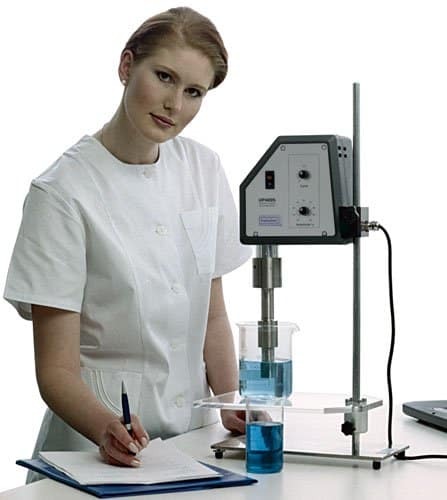 These devices are mainly used for sample preparation or initial feasibility studies and are available for rental. 500 and 1,000 and 2,000 watts ultrasonic processors like the UIP1000hd set with flow cell and various booster horns and sonotrodes can process larger volume streams. Devices like this are used in the optimization of the parameters (like: amplitude, operational pressure, flow rate etc.) in bench-top or pilot plant scale. Ultrasonic processors of 2, 4, 10 and 16kW and larger clusters of several such units can process production volume streams at almost any level. Bench top equipment is available for rental at good conditions to run process trials. Results of such trials can be scaled linear to production level – reducing the risk and costs involved in the process development. We will be glad to assist you online, on the phone or personally. Please find our addresses here, or use the form below. Various components, such as pigments, fillers, chemical additives, crosslinkers and rheology modifiers go into coating and paint formulations. Ultrasound is an effective means for the dispersion and emulsifying, deagglomeration and milling of such components in coatings. Coatings fall into two broad categories: water-borne and solvent based resins and coatings. Each type has its own challenges. Directions calling for VOC reduction and high solvent prices stimulate growth in water-borne resin coating technologies. The use of ultrasonication can enhance the performance of such eco-friendly systems. Ultrasound can help formulators of architectural, industrial, automotive and wood coatings to enhance the coating characteristics, such as color strength, scratch, crack and UV resistance or electrical conductivity. Some of these coating characteristics are achieved by the inclusion of nano-size materials, e.g. metal oxides (TiO2, Silica, Ceria, ZnO, ...). Ultrasound does further help in the defoaming (entrapped bubbles) and degassing (dissolved gas) of highly viscous products. As ultrasonic dispersing technology can be used on lab, bench-top and production level, allowing for throughput rates over 10 tons/hour it is being applied in the R&D stage and in the commercial production. Process results can be scaled up easily (linear). Hielscher ultrasonic devices are very energy efficient. The devices convert approx. 80 to 90% of the electrical input power into mechanical activity in the liquid. This leads to substantially lower processing costs. Below, you can read about the use of ultrasound in the emulsification of polymers in aqueous systems, the dispersing and fine milling of pigments, and the size reduction of nanomaterials. Traditional coating formulations use basic polymer chemistry. The change to water-based coating technology has an impact on raw material selection, properties and formulation methodologies. In conventional emulsion polymerization, e.g. for waterborne coatings, the particles are built from the center to their surface. Kinetic factors influence particle homogeneity and morphology. Ultrasonic processing can be used in two ways generate polymer emulsions. The polymerization of particles in miniemulsions allows for the manufacturing of dispersed polymer particles with good control over particle size. The synthesis of nanoparticulate polymer particles in miniemulsions ("nanoreactors"), as presented by K. Landfester is method for the formation of polymeric nanoparticles. This approach uses the high number of small nanocompartments (disperse phase) in an emulsion as nanoreactors. In these, the particles are synthesized in a highly parallel fashion in the individual, confined droplets. In her paper (The Generation on Nanoparticles in Miniemulsions) Landfester presents the polymerization in nanoreactors in high perfection for the generation of highly identical particles of almost uniform size. The image above shows particles obtained by polyaddition in miniemulsions. Small droplets generated by the application of high shear (ultrasonication) and stabilized by stabilizing agents (emulsifiers), can be hardened by subsequent polymerization or by temperature decrease in the case of low-temperature-melting materials. As ultrasonication can produce very small droplets of almost uniform size in batch and production process, it allows for a good control over the final particle size. For the polymerization of nanoparticles, hydrophilic monomers can be emulsified into an organic phase, and hydrophobic monomers in water. When reducing the particle size, the total particle surface area increases at the same time. The picture to the left shows the correlation between particle size and surface area in case of spherical particles (Click for larger view!). Therefore, the amount of surfactant needed to stabilize the emulsion increases almost linearly with the total particle surface area. The type and amount of surfactant influences the droplet size. Droplets of 30 to 200nm can be obtained using anionic or cationic surfactants. Organic and inorganic pigments are an important component of coating formulations. In order to maximize the pigment performance good control over the particle size is needed. When adding pigment powder to waterborne, solventborne or epoxy systems, the individual pigment particles tend to form large agglomerates. High-shear mechanisms, such as rotor-stator mixers or agitator bead mills are conventionally being used to break such agglomerates and to grind down the individual pigment particles. Ultrasonication in an extremely effective alternative for this step in the manufacturing of coatings. Ultrasonic processing over high speed mixers, media mills is the more consistent processing of all particles. This reduces the problem of "tailing". As it can be seen on the picture, the distribution curves are almost shifted to the left. Generally, ultrasonication does produce extremely narrow particle size distribution (pigment milling curves). This improves the overall quality of the pigment dispersions, as larger particles typically interfere with processing capability, gloss, resistance and optical appearance. Since the particle milling and grinding is based on inter-particle collision as a result of ultrasonic cavitation, ultrasonic reactors can handle fairly high solid concentrations (e.g. master batches) and still produce good size reduction effects. The table below shows pictures of the wet-milling of TiO2 (Click at the pictures for a larger view!). The picture to right (Click for larger view!) shows the particle size distribution curves for the deagglomeration of Degussa anatase titanium dioxide by ultrasonication. The narrow shape of the curve after sonication is a typical feature of ultrasonic processing. Nanotechnology is an emerging technology making its way into many industries. Nanomaterials and nanocomposites are being used in coating formulations, e.g. to enhance abrasion and scratch resistance or UV-stability. The biggest challenge for the application in coatings is the retention of transparency, clarity, and gloss. Therefore, the nanoparticles have be very small to avoid interference with the visible spectrum of the light. For many applications, this is substantially lower than 100nm. The wet grinding of high-performance components to nanometer range becomes a crucial step in the formulation of nanoengineered coatings. Any particles that interfere with the visible light, cause haze and loss in transparency. Therefore, very narrow size distributions are required. Ultrasonication is a very effective means for the fine milling of solids. Ultrasonic cavitation in liquids causes high speed inter-particle collisions. Different from conventional bead mills and pebble mills, the particles themselves are comminuting each other, rendering milling media unnecessary. Companies, like Panadur (Germany) use Hielscher ultrasonic devices for the dispersing and deagglomeration of nanomaterials in in-mould coatings. Click here to read more about this. For the sonication of flammable liquids or solvents in hazardous environments FM and ATEX-certified deivces, such as the UIP1000-Exd are available. Oil prices and greenhouse gases as well as the sustainability of fuel sources became a focal point of interest in the oil & gas industry. Hielscher ultrasonic devices are used in research facilities and processing plants for many applications. Ultrasonic devices made by Hielscher are used for many processes, such as mixing, dispersing, homogenizing and dissolving of powders into liquids, as well as for the production of stable emulsions. This flexibility opens up many applications in the production of fuels. Read on to discover the potential of ultrasonics for fossil and renewable fuels. Introducing water into the fuel combustion has been proven to lower the NOx emissions. Water added to the fuel lowers the combustion temperature due to water evaporation. When the water evaporates, the surrounding fuel is vaporized too -increasing the surface area of the fuel. The ultrasonic emulsification is an effective means for generating fine-size fuel/water-emulsions. Click here to read more about NOx-reduction using ultrasonication! An innovative alternative to hydrodesulfurization is the ultrasonically assisted desulfurization. High local temperatures resulting from ultrasonic cavitation change the chemical reaction kinetics of the desulfurization process. This effect allows for alternative - less expensive - catalysts or alternative desulfurization chemistry to be used. Click here to read more about Sonochemical Desulfurization! Biodiesel is a renewable fuel - an alternative to diesel fuel made from petroleum. Biodiesel is made by transesterification from sources, such as vegetable oil, algae oil, animal fats or grease. The manufacturing of biodiesel involves the catalytic reaction with alcohol. Ultrasonic mixing of the oil, fat or grease with the alcohol improves the reaction speed and yield significantly. This reduces investment and operational costs. Click here to read more about ultrasonic mixing reactors for biodiesel! Bioethanol is used as a green alternative to gasoline. It is made from corn, wheat, potatoes, sugar cane, rice and other grains by fermentation. Yeast is used to ferment the starch and sugars found in these crops to ethanol. Ultrasonic disintegration of cellular structures and extraction of intracellular material reduces the particle size and exposes a much larger surface area to enzymes during liquefaction. This improves the bioavailability of starch and sugar and results in faster and more complete fermentation leading to more ethanol. Click here to read more about cell disintegration and extraction! The processing of organic waste, sewage sludge, muck and manure in aerobic or anaerobic digesters converts the organic material into biogas. Ultrasonic disintegration of the organic material prior to digestion alters the material structure, and releases and activates enzymes. This improves the digestion of the organic material leading to faster processing, more gas and less residual sludge. This in turn increases the capacity of existing digesters and reduces disposal costs. Click here to read more about ultrasonic sludge disintegration!